For the record, I tweeted that joke well before Jon Stewart used it on the Daily Show. In 2010, I took a leave from Local 26 to spend five months in Washington DC leading SEIU’s national immigration campaign. Our goal was to move our immigration work beyond a policy operation and into a more aggressive campaign. No sooner had I arrived in DC immigration news, which had been on a backburner of public policy debates, came back to the forefront thanks to Jan Brewer’s Arizona. Having spent a lot of time thinking about, campaigning against, mocking, and studying Arizona’s immigration law, I can say today’s ruling was generally positive — with one important exception (see below). Jan Brewer’s declaration of “victory” notwithstanding, the High Court struck three of the four provisions it considered and reaffirmed the federal preemption of state immigration laws. The Supreme Court slapped down the notion that we could have a 50-state patchwork of immigration laws. Its decision also reinforced in important ways the discretion the federal government has in enforcing immigration violations — which is to say, the court implicitly and preemptively shot down any notion, for example, that President Obama exceeded the authority of the federal government when he recently announced that the federal government would halt the deportation of many young immigrants. 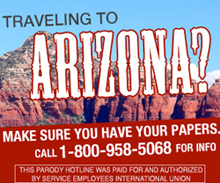 SEIU’s national immigration campaign spoofed Arizona’s law in 2010. How’s that for a line if you’re looking for something, pro-immigrant and positive in the Court ruling? (p.15). A lot has already been written about how the decision“was largely (but not entirely) a victory for the federal government.” (For a handy summary of the decision, see the ACLU’s infographic here). I’d like to focus on one particular aspect of the decision: its implicit reinforcement of the Obama administration’s recent changes in immigration enforcement priorities. Essentially, the Court states exactly what the Administration argued on June 15th that had anti-immigrant politicians heads exploding and had Mitt Romney’s tongue tied into knots. The Administration argued that it had the authority to prioritize enforcement and that the right thing to do was to de-prioritize and halt the deportation of hundreds of thousands of young people brought to the US by their parents and family and have led good lives in the only country they know as home. In his dissent, Scalia noted precisely the implication of this reasoning when it came to the recent Obama announcement. And he had a conniption fit. Brewer and the author of SB1070 Kris Kobach declared today’s ruling a victory because it upheld the provision that allowed police to request immigration documents if they have reason to suspect the person is in the country illegally. Not so fast on corking that champagne, Kris and Jan. 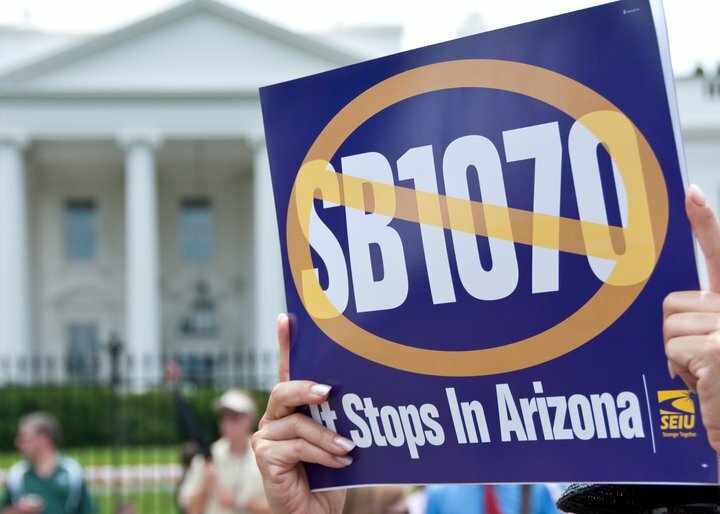 The Court ruled that the Arizona legislature had prettied up the SB1070 law enough that we could not yet prove that it would lead to racial profiling. And let us not forget that racial profiling was precisely the intention of the bill as originally written. Advocates argued that these revisions were still not enough to prevent racial profiling. The High Court said, “well, maybe, but you have to let them do it first.” Not exactly comforting, but –In a word–the fight is not over. Today’s ruling created other stumbling blocks for implementing the law as Arizona legislators had intended. “There was a catch, however. The court decided that officers cannot detain anyone on an immigration violation. That is, unless federal immigration officials say so. “Hours after the ruling, the Department of Homeland Security canceled agreements with seven Arizona police departments that deputized officers to arrest people on immigration violations while on street patrol. From a protest outside the White House when Jan Brewer met with President Obama in 2010. You can’t blame Jan Brewer for trying to claim total victory, even if it does get her mocked in a press conference. And we must admit that, so far, SB1070 has not hurt her electoral career. So far. But remember back when Pete Wilson championed Prop 187? Everyone said that was good politics for him then – and it was for a while. It also made the state unwinnable for Republicans running for president in the years since. Demographic trends in Arizona tell us the very same could be true there very soon. So, reacting to the Supreme Court decision, Mr. Romney said he believes states have the right to do exactly what the court reaffirmed today they cannot do – preempt federal law. Very solid thoughtful analysis of the climate, the law, the Court decision. And thoughts about our future. Nice job! For an account of how SB 1070 and the officials abusing power in Maricopa County, read my novel, “A Dry Hate”.